Can you believe it? Here beckons the start of June. The summer has arrived! The season is about to begin! And boy, what a difference a year makes! London Calling 2014 delivers yet again with another great turn out in the women’s Tour with 24 teams signed up and raring to go. Most exciting however, is that this year promises more depth than ever as preparation for World clubs has strengthened the level of competition ready to descend on St Albans this weekend. Whilst some have complained that Tour maintains a sense of predictability ten years in, the battle amongst the top 8 and the top 12 is finally feeling like a more competitive affair. There really is no telling just how much the seedings will be turned over in any of these brackets. It would be safe to assume that the three teams contending at world clubs will be found at the summit of Tour. However, in terms of who will take the title, it does seem somewhat likely that Iceni will rule the roost once again. In preparation for Worlds, Iceni have had a marked overhaul under the leadership of Sonia Komenda and Ange Wilkinson, in recognition of the serious demands required in order to challenge top teams in Italy. They go into Tour 1 extremely well prepared, with months of bi-weekly trainings and professional fitness instruction under the guidance of former Clapham player Paul ‘Voodoo’ Waite who has committed his season to them. Nevertheless, in having not attended the inaugural NFL (Not Fog Lane) a couple of weeks ago, Tour will be their first demonstration of their hard work. With the introduction of a new ‘north American’ style structure and the complete scrap of vertical stack from their offensive repertoire, will it all come together in time or will others be able to take advantage of their somewhat inexperienced tactics? 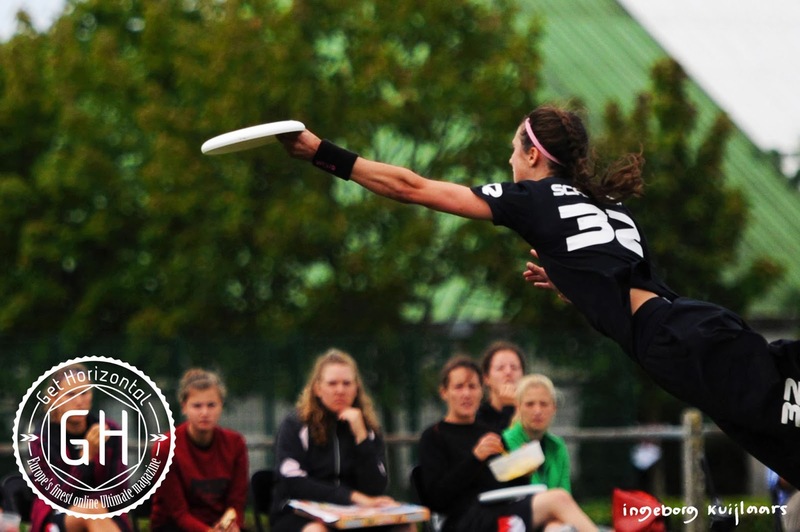 Joey Holmes getting off her feet for a D at UKU Club Nationals 2013. Photo courtesy of Andrew Moss. Bristol have shown the same dedication and intensity to their training over the past few months, ( in fact Bristol’s impressive team effort in preparation for Worlds has even seen them wangle some TV and radio appearance along the way!) but they have already signalled that teething problems remain. Whilst Bristol take their loss to SYC in the final of NFL in their stride, it may be that they don’t place as highly as expected whilst they continue to find their momentum. However, their decision to split their worlds squad for Tour in favour of using the tournament as further opportunity to harness close connections and rapport amongst players suggests their aim goes beyond taking domestic victory. It is without doubt that the welcome international cohort we enjoy at London Calling will also have their eyes on victory. This year two teams will be making the trip over: E6 from Sweden, and YAKA from France. In such an important club year, it is a shame that so few Europeans have managed to be enticed. Little is known of the current state of this Swedish team who did not make an appearance in Bordeaux last year. Needless to say, they have always sported a team of extremely hard working and gritty players, with an experienced core leading the way. They will surely be looking for upsets. YAKA should equally expect to fair well on UK soil, having finished above Bristol, SYC and LLL at xEUCF 2013 . Even though they missed out on qualifying for worlds, they will be carrying confidence from taking the title at the recent ‘Siege of Limerick’. However, the loss of their famous talisman since then, Aline ‘Rasta’ Mondiot, who has hopped across the Channel to train and play with SYC this season could prove to be huge. Indeed, this reshuffle of players as a result of selection and qualification of World Clubs has both seemingly strengthened established clubs and stimulated new ones, particularly in the south. Iceni’s much stricter selection process released a wealth of talented women to bolster clubs such as SYC and Crown Jewels as well as initiate the formation of Phoenix and Free Agents. All will be pushing for the best result possible in the top half of the Tour. Of the two new clubs, we know that despite their newness, Phoenix (formed of ex- Iceni / Herd players) are serious about competing having exploited the wisdom of local beardy guru, Jaime Cross. Free Agents on the other hand are a motley crew of ex Iceni/SYC who haven’t committed to any trainings this year. Whilst they will be looking to cause trouble, the ‘name tags’ of this team, which include reigning Paga queen Bex Forth shouldn’t assume victory over those that have been working hard all season. In the face of this new competition, others expecting a top table finish will surely be the legends of ROBOT, the Scottish contingent, Swift, and the big movers and shakers of last season, Punt, who all rounded off last season comfortably in the top 10. Looking further north LLL will also be keen to cement their strength after a phenomenal success at developing an incredibly talented core of young players. They appear to have become a real beacon for attracting committed players in the north, with some team members even commuting from as far a field as Scotland. They mean business! Nevertheless, those teams who are looking to kick off the season with a more modest seeding, who train less frequently, are still capable of surprises. Whilst the battle for the mid table already looks rather crowded this year, there is welcome room for new outfits Manchester and Devon to ruffle some feathers. Both these teams have been established and managed under the guidance of former GB players who have invested in their local area. Up in Manchester, Julia ‘Jools’ Murray and Claerwen Snell have been providing lots of structure to trainings with guest coaches and fitness expertise on hand. So whilst they may lack experience, expect a well-drilled, well informed, skilled team who know their fundamentals. Despite my prediction that a full powered Iceni – desperate to play all together for the first time – are going to storm London Calling, I no longer see a divide between the top 4 and the rest as in previous years. There is everything to play for in the top bracket whether it’s the 3v4 or the 9v10, and woe betide any team that goes to Tour 1 resigning themselves to formality this weekend. Things are looking truly exciting in Women’s ultimate after the 2013 shake-up, and now it really is a case of if you don’t take it, someone else will! Excitement is building steadily for the season opener in less than 24 hours. Our final preview of international teams is on the way! Looking back over last season, something that’s puzzling me is something I’ve not given much thought before now. Perhaps it’s because 2013 was my first time at the helm of a club team. This is the first time I’ve realised just how important squad size is. On the surface the topic of squad size sounds pretty dull but it has lots of layers to it. No doubt there are lots of teams and individuals out there that have different experiences and opinions on what works best. I write from the viewpoint of the women’s division on the UK domestic tour and at xEUCF 2013. I haven’t done a ton of homework collecting stats from each team about who played when and where, nor have I acted upon the knowledge that Iceni significantly shortened their lines in the final at Europeans last year. I’m sure had I done this a few home truths would be revealed both statistically and anecdotally but that’s still up for discussion. At the LLLeeds Ladies AGM last year it was clear that 2013 was going to be a fresh start and the drive for new players was a priority. Turns out there’s a lot of female frisbee talent in the north and luckily trials were packed out. In summary: we settled with a squad of 22 which quickly went down to a tour team of 17 through unfortunate injuries and drop-outs. Leeds Women at London’s Calling 2013. Photo courtesy of David Sparks. We finished 4th at Tour and at Nationals and came 15th (last) at Euros. We went to xEUCF with 12 players. In Bordeaux we didn’t play a team with fewer players than us and we didn’t finish in the same bracket as any of the other UK teams. In fact we didn’t actually win a game (story of my 2013 life) but I’m confident in saying this was one of the best tournaments I’ve played in from the perspective of being a “team” and in terms of players’ development. We lost in part due to the lack of playing experience and in part due to legs. With a bigger team I think we could have won a game or two. At the start of last season, xEUCF wasn’t even on our radar so we had no expectations about taking titles; LLL were in that well-talked about “development season”. What baffles me though is that Tour, Nationals and European Champions Iceni were arguably in a development year too. They held weekly winter sessions open to all, then took a squad big enough to field two teams at tours 1 and 2, giving a large number of London based players regular quality weeknight practices with coaching and game play. So is the question really about development versus winning? Yes. At xEUCF Iceni’s large squad had 27 rostered players and they went on to win. I’m not going to dispute how good winning feels but I get the impression there is some contempt among some Iceni players who went to France but didn’t get a proper jab at the final. Would it have been better for Iceni to focus on using the whole team, as evenly as was feasible, and let everyone have a shot playing in a European final? I’d argue that the only way we can develop women’s ultimate is to do precisely that. A team works hard together to get to the final and then all players contribute on pitch in the big game. Easier said than done; if we want women’s ultimate in the UK to improve in line with the rest of the world we need to empower the new talent we’ve just spent a season nurturing. That means even amounts of pitch time in the biggest games of the season. Possibly for Iceni that can be achieved by moving towards a more possession rather than their current yardage based style of play and potentially by taking a slightly smaller team to xEUCF. Their opposition in the 2013 final was U de Cologne, a relatively fresh team on the circuit who were joined by the formidable force of former European champions Sara Wickstrom and Susanne Theimer. They rocked up with 17 players and came second. If it was all down to legs then surely Iceni should have panned them, right? Perhaps I’m underestimating both the powerhouse that is Cologne and the combined experience within Iceni last year but I’m definitely not underestimating the power of pitch time for player development. Perhaps my initial assumption that Iceni were in a “development season” this year is wrong. If so, that may explain why despite already qualifying for 2014 World Clubs they still shortened their lines in the final of xEUCF. I don’t know the ins and outs of who got more/less pitch time and the reasoning behind it but it would be interesting for someone to shed some light on the topic. There’s a risk that some people may interpret this article as an excuse for some Iceni-bashing, ignoring the themes at its heart. But I’ve noticed, since moving to London earlier in 2013, it’s obvious that there’s a real buzz about women’s ultimate here at the moment and it’s something to be harnessed. I strongly believe the capital has space for two strong geo women’s teams. I wonder what would happen if Iceni took a smaller squad at the beginning of a season and if this would add fuel to the development of the women’s scene in London. Many cite Iceni’s established geo-ethos as a reason to trial as it enables regular well-attended practices. Surely that’s what almost every team is striving for but can’t always deliver. With a more even distribution of geo players across – still distinctly separate – London teams and a combined closed London women’s practice, could we achieve the best of both worlds: quality practices and more of the ‘tough game’ pitch time? Other benefits would include: pushing the skills of more players already near the top of their game, creating better contact between clubs and potentially forging connections in preparation for future GB teams. Development isn’t just about coaching and improving, it’s about tournament experience and knowing what it takes to be a cog in a bigger machine. More pitch time means more contribution to your team’s efforts and more experience playing different opposition. Some hold the viewpoint that if you’re fully engaged in your team you can be just as engrossed in a win when supporting from the sideline as you would through playing on pitch. In my opinion sideline can never be a substitute for feet on pitch and hands on disc. The UK’s performance at the top for both club and country will only continue to improve if we seek to give our players the chance to match up, train with and compete against the toughest opposition possible. What do you think? Feel free to comment below, or even better submit a response to theshowgame@gmail.com. Charlie Blair looks back at the 2013 season and ahead at what’s to come in 2014. With 2014 just around the corner, the Women’s Tour is about to embark on its tenth year. It is only fitting then that this year was one of landmark achievements, with our domestic battles being heightened by the two qualification spots at WUCC up for grabs. Moreover, this qualification process instigated pioneering changes to the organisation of the divisions this year; ones that appear to be forcing many women’s clubs to reassess their form and direction. As tSG reflects on some of the triumphs and challenges of the season, what can we expect from the season ahead? The UK Women’s Tour proudly concluded this year’s campaign triumphant in Bordeaux, with representation from four British clubs at xEUCF; a reflection of the depth within women’s ultimate in this country that remains unmatched by any other European nation. As such our clubs were arguably responsible for some of the most spectacular games of the tournament, notably those of the final and the ‘game to go’. For SYC, such a game took its toll on a 13 woman squad that had lost several players throughout the season to injuries, babies and the Middle East! They too applaud each other for inspirational play but credit the strength of Bristol’s handler movement, unrelenting upon their fatigue. It was a ‘devastating’ loss after having been in the lead, and unfortunately one which seems to reflect the positive start to the season they had, that faded as Bristol began their ascendency and usurped SYC’s place in the Tour 3 and Nationals finals. In contrast, this victory cemented a landmark year for Bristol who not only qualified for worlds for the first time in their club’s history but also took home their first ever Tour victory in Cardiff, against Iceni. Not to mention taking home the Spirit prize from Euros for a second year in a row. Unsurprisingly then, Iceni are having to respond to the challenges they faced from both Bristol and their European counterparts this season. In the xEUCF final, Iceni, keen to send a strong message to the world having already qualified for WUCC, were pushed harder than ever to defend their title in what was visibly their toughest mental and physical game of their whole season. A victory required some super human efforts from the likes of Fran Scarampi who injected the momentum into her team to see out the game. Francesca Scarampi making ‘that huge grab’ in the xEUCF final. Picture courtesy of Ingeborg Kuijlaars of Get Horizontal. 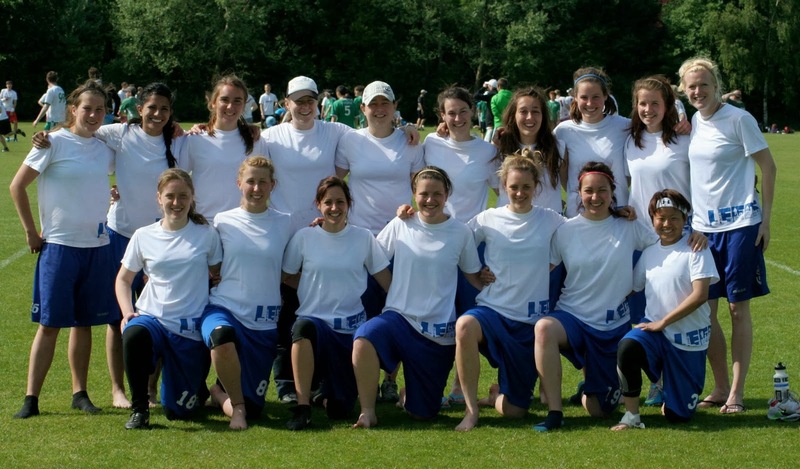 For Iceni, 2013 was the beginning of a two year season that culminated at WUCC. Therefore, they took the opportunity to choose a very big squad and train regularly this year. But as Ange Wilkinson admits, this became a ‘bit of a balancing act’ having such a large number of talented and hard-working athletes to manage. Particularly with so many other international commitments demanded from a substantial portion of the team. Consequently, chinks in the Iceni armour did indeed show this year and so looking forward to 2014 they seek ‘a renewed commitment from all our players to really push their own, and the team’s boundaries’. And it is such success that their peers delight in sharing in, and for many of whom, Bristol have been the most impressive team on the Women’s Tour this season. Their confidence, communication and strong fundamentals have impressed the leadership of both Punt and Iceni, whilst Megan Hurst of Seven Sisters considers them ‘a real role model for the women’s scene in general’. She sees them as a great example of a geo club who don’t share the graduate pulling power and transport links of London. I agree that it is exactly this kind of inspiration that the Women’s Tour desperately needs. Now that Bristol have gone some way to dispelling the predictability of Women’s Tour, it’s not just Iceni who have been encouraged to reorganise their aims and structure after this season. Seven Sisters can only speculate how they will look next year, having decided to focus much more exclusively on home grown and local players rather than being a satellite outfit. Whilst SYC are looking to hold more frequent London trainings and take a bigger squad. As such, this trial period, captain Cesca Tyler is keen to see ‘the SYC Saturday sessions attended by as many London based or close to London women as possible, whatever team played for’. Moreover, the success of Leeds Leeds Leeds is testament to the need for strong local foundations. It was these that allowed them to surpass even their own expectations, with captain Hannah Boddy admitting, ‘Euros wasn’t even on my radar in January!’. But despite much of their team never having ever played tour before, they were elated to maintain a consistent fourth place position. Boddy accredits this to the unity formed amongst her players who frequently trained with local geo teams, outside of tournaments and Leeds weekend trainings. In her eyes, the ability to build a successful team from scratch had much to do with a proactive attitude to skills days and local university team success, which has fostered the ‘ambition, talent and dedication of the ladies in the north’. Nevertheless, the adjustments that some of these clubs intend to make to their organisation can also be seen as a natural response to the simultaneous hosting of Women’s and Mixed nationals this year. It is no surprise that Women’s clubs are now demanding greater commitment (to varying degrees!) from their players, more or less forcing them to make the choice between the two divisions in alignment with the changes to the tournament calendar. Certainly, Iceni has made that abundantly clear, having organised all training weekends over the mixed tour dates. ‘I think you could equally say that having mixed nationals alongside women’s resulted in a low show for mixed, in terms of really top teams anyway (eg RGS and Magic Toast were consistently top four at Mixed Tour but all their players are on Iceni/Clapham/SYC/Chevron). What is certainly true is that there currently isn’t a sufficient player base of female players to have high quality mixed and women’s at the same event’. Whilst some may lament what appears to be a withdrawal of playing opportunity for women and damaging to the women’s game, in fact this separation is creating more opportunity for women, and of much higher quality. In my opinion, it has simultaneously highlighted the great dearth of female participation in Ultimate and provided the capacity to absorb and develop new talent to resolve that. A greater commitment to either women’s or mixed clubs will also allow them to create a greater legacy that is not totally reliant on a certain generation of players to sustain it. So whilst we may not see PUNT return to full force and picking up from where they left off from 3rd place at Tour, we can look forward to what new local outfits have to offer us in 2014, as well as those not distracted by international ambitions. Swift will be looking to develop strength again in the wake of losing players to mixed this season. In addition, there is excitement surrounding the inception of a Manchester based women’s team who have started to train under the leadership of experienced players such as Jools Murray. Equally, World Games star and A Tour regular, Izzy Burke, has already started training up a Devon women’s team as early as this September in preparation for the 2014 season! And if the training shirts and fresh faces in the pictures of their first training session is anything to go by, it appears to be a much needed vehicle for talented juniors to have the opportunity to not simply be exposed to Tour, but train for it. Devon Women have their first training. Photo courtesy of Devon Ultimate. So this year Women’s Tour was a landmark year in terms of long term orientation, with a wakeup call from upsets on pitch, and some artificial cajoling from the UKU’s scheduling off pitch. 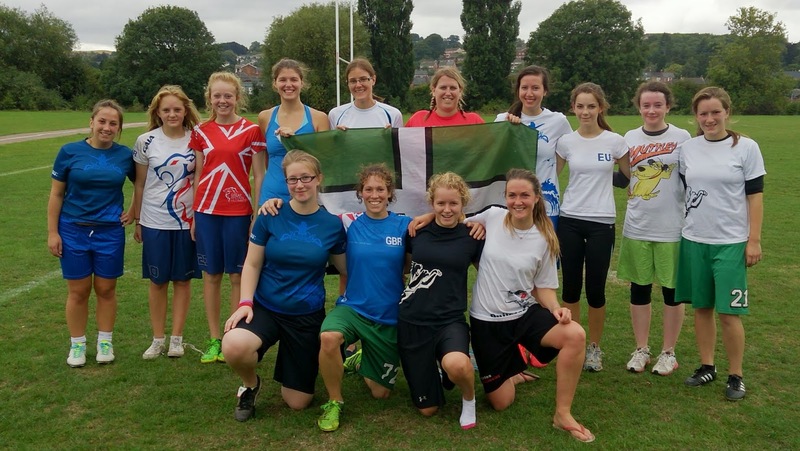 tSG wishes Iceni and Bristol the best of luck in their preparations for WUCC and will be following them all the way! And here’s hoping that this inspiring commitment from so many clubs and individuals to develop women’s Ultimate will produce the best attended Tour season with the highest quality games to date. Nothing less than what its tenth anniversary deserves! Awesome! So much going on here at tSG HQ, are you ready for it? Andrei Mandzuk from Bangor Ultimate takes us through the Northern Region. The weekend marks the start of the Northern University indoors season, with teams from across the region converging on Leeds to battle it out for prestigious spots at Nationals. The north consistently proves itself to be a strong but very open region, with an array of teams feeling that they’re in with a shot of qualifying. After going through what many felt was a developmental period for the region last year, it is expected to return to full strength with many key players reaching their final years of study. I shall begin by providing short previews of top teams in the region in order of their predicted seeds. All content below is based on predictions from team captains and information gathered from the UK Ultimate rumour mill. 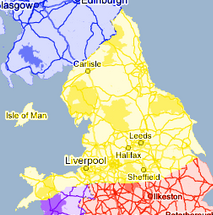 One of the biggest regions and what a region! Image courtesy of UK Ultimate. Manchester will undoubtedly be going into Regionals as top seed after consistently winning the region in recent years, and claiming a silver medal at Division 1 Indoor Nationals last season (ED: Second in 2012, 2011, 2009 and Bronze in 2010). Despite a high turnover from last year’s squad they have retained Chevron player Jake Aspin for another year running. Alongside this, their strength will be sustained by the maturation of GB u20 Simo Low and picking up GB u23 Mixed MVP Steve Dixon as an undergraduate. A 3rd place finish at Sheffield Experienced has shown them to be the region’s top team once again. Sheffield are a team who’s strength lies in the A Tour experience at the top of their roster with Manchester Ultimate’s Dan Sumner and LeedsLeedsLeeds’s David Sparks. Along with this, their core is completed by the pickup of Will Jackson from Halcyon. They’re expected to run the same strict iso which proved so effective on the large pitches at Ponds Forge last year, and will keep the disc in the hands of their key players whilst challenging teams with athletic man-to-man defence. Although they gathered mixed results, Phat’eds are a team who managed to enter three warmup tournaments and this pitch time together may prove invaluable at the weekend. Leeds almost caused the upset of the tournament last year, reaching the final and taking Halcyon to double game point. They will look to run a traditional offense, controlled by veteran Nick Moss, and captain Joseph Fisher, both of LeedsLeedsLeeds. They have tended to throw a mix of solid man defence, alongside a poachy zone which looks to prevent breakside throws. With disappointing results at warmup tournaments and losing varsity to local rivals Leeds Met, Regionals is their chance to prove themselves as a force in the North for another year running. Newcastle are another team who qualified for Division 1 at last year’s Indoor Regionals but have been struck with a high player turnover from last season. This has given role players the chance to step up and it’s expected that Alex Mazzon will top the score sheet, with Ben Withers getting a lot of touches on the disc upfield. Despite getting incomplete rosters to warmup tournaments, and chalking up results at both ends of the spectrum, they’re a team who will be looking to show that their strength runs deeper than in previous years. Durham are not a team who are known for strong indoors performances, instead using it as a chance to build their team for the outdoors season. Although they’ve suffered with large numbers of players graduating from the team that qualified for Division 1 at outdoors last season, they too will be looking to show a strength in depth that’s built on their impressive collegiate participation. A solid 6th place finish at Sheffield Experienced shows that they’re going to be hungry to push for indoors qualification this year. Liverpool will be looking to avenge a poor showing at Indoor Regionals last season and show more similarities to their solid performance at Div 2 Outdoor Nationals. With last year’s handler core graduating, Sion Regan will be looking to experienced players Stuart Johnston and Andy Garner to control the disc upfield whilst he produces a downfield matchup to be feared. Despite being a team with their eyes on the bigger picture of outdoors, they’ve shown to be well organised and produced an impressive 4th place finish at Liverpool Experienced. It would be foolish to write them off again this season. Leeds Met have fostered an impressively growing program in recent years, shown by qualifying for last year’s Division 2 Indoor Nationals after winning the game to go. Chevron player James Mead will look to make plays both on and off the disc, and Cambridge Mixed’s Dave Littler will control the disc upfield. Coming off the back of mixed results at warmup tournaments but a convincing victory over local rivals Leeds at their varsity, this is a team who are hungry to sustain last year’s success. Bangor are a team who have graduated only one player from last year’s outdoors squad. Despite this, a run of poor luck on the injury front alongside personal issues has left them shorthanded for this year’s Regionals. Expect big plays on both sides of the disc from Daniel McLean and GB u23 Mixed’s Cameron Burgess as the team tries to gel after being forced to take a skeleton squad to Liverpool Experienced. Lancaster are a team who are going through a rebuilding phase currently and are still reeling from losing all of their Nationals qualifying first team. Despite this, they reached the game to go last year against Leeds Met and will look to go into the tournament to cause upsets this year around. Captain Reece Stanton will aim to find Michael Sharkey downfield for large gains. Sheffield Hallam are another team who, similar to Leeds Met, pick up a sport-minded group of beginners each year. This is shown by their success yet again in beginners tournaments and is always promising for future years. Hallam, led by GB u23 Mixed’s Alex Walsh will look to take advantage of this, as he tries to find athletic cutters downfield. Teams should expect a hard running defence and tough match-ups all across the pitch. York are set to be the big story of this year’s Regionals. A team which has been built from the ground up is set to peak this season in spectacular fashion. They have had strong results at warmup tournaments, and been tipped by many captains to be the team to watch. This year’s York team looks to establish themselves as a force in the North. Cohesion gained from the core of the team playing on the successful ‘fun’ team SMOG, and 2 years of university pitch time together will serve them well as they look set for their most successful year in recent history. Joshua Briggs will be throwing the bulk of their assists to tall cutter Max Moseley, although any of their athletic core can be a force downfield. Hull are an inexperienced team who will be looking to use Regionals to develop. Led by captain Nick Brownbill and tipped to be a team who keeps working until the buzzer, it’s not hard to see them scaring some of the less well organised ‘big’ teams. Chester are another growing program in the North. Captained by GB u23 Mixed’s Ben Main they produced impressive results at Liverpool Experienced, making their way into the top 8. They are fielding an inexperienced, but enthusiastic team. Main will try to control the disc on offense and their offensive flow comes out of a traditional vertical stack. Going into Regionals with no expectations and everything to gain they can look forward to a productive weekend! On the back of this all, I’ve based predictions on the surveys we had returned and pre-season results. As with previous years, Manchester are expected to top the region, albeit not without serious pressure from other contenders, and will hope to go on to replicate their impressive performance at Nationals last year. With impressive pre-season results, and mentions from many captains as being much stronger than previous years, it wouldn’t be surprising to see York secure themselves a second place finish this weekend. Rounding off the qualifiers for Division 1 are Sheffield. Selected by all captains to be up there, and with solid pre-season results, they should be able to secure the final spot. Division 2 is far more open, with as many as six teams having a genuine shot at making it. Both Liverpool and Newcastle performed well at Liverpool Experienced (despite Newcastle’s depleted squad) and could take the 4 and 5 spots respectively. Rounding off the qualifications places, it’s hard to avoid the romance of a home town varsity rematch in the game to go, with Leeds Met facing off against Leeds Uni. It’s a tough one to call, but I’m tipping Met to win this one and repeat their varsity success. Outside of the top 6, other contenders for qualification are Durham and Bangor. I suspect Durham’s pedigree for not quite clicking indoors will continue, whilst Bangor’s lack of pitch time together will be their unravelling. With the Northern Region seeing one of the most open battles to date, I look forward to seeing all the drama and upsets that University ultimate can produce. Good luck to all competing in Leeds this weekend, and I’ll see you Saturday! That’s all for the uni indoor regional previews, sadly we were unable to hear from the Western region but good luck to everyone competing across the country! DP @ tSG.